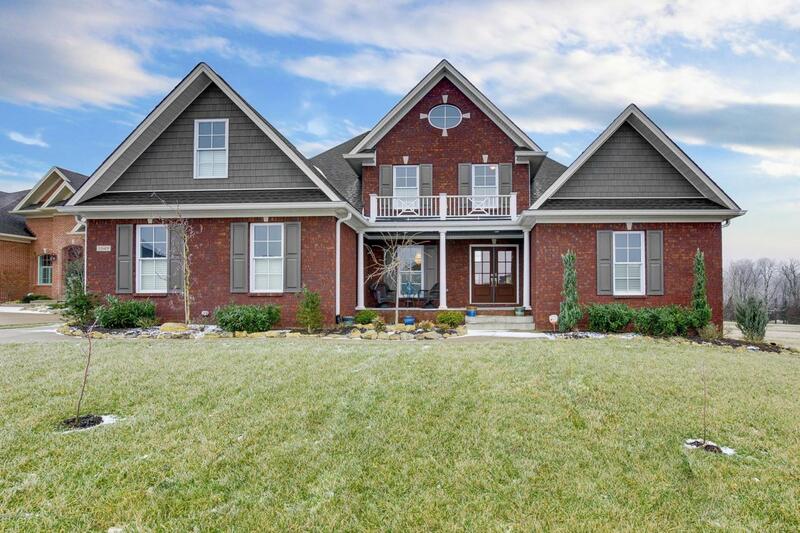 Welcome to 1049 Champions Circle Simpsonville, KY. This impeccably designed, expertly built executive residence overlooks the 11th fairway at U of L's acclaimed Cardinal Club w/one the best views from it's 50 ft rear porch w/no steps/barriers from the terrace to lawn to the golf cart path. The exterior boasts professional landscape/maintenance w/brick/composite trim/Anderson windows/zoned irrigation and architectural curb appeal. The interior boast amenities one would expect w/a gracious entry w/ Formal Dining on the left as you enter and a study or 5th bedroom on the right. As you enter the great room the 12' sliding doors show off the impressive view however the tiled Napoleon gas see-thru fireplace w/ accent lighting, rustic mantel, floating shelves and towering trusses in the2-story vault have eye appeal of their own. The kitchen has a huge refrigerator/freezer, drawer microwave, double oven w/gas cook top and pot filler w/upgraded granite, profile subway tile backslash. The Master bath has a separate soaking tub and zero threshold shower, heated towel rack, marble vanity, accessible toilet and large walk in closet. The upstairs has an additional 3 bedrooms w/ one having a balcony overlook. The just completed basement is an incredible use of stone, brick, plank & quartz for additional 1.200 sf of family space & still plenty of storage. 24' x 24' garage w/ largest garage door made to provide easy access. This house was designed w/ age in place/universal features.